Why to place an advertisement at us? The information-providing portal www.travelguide.sk is one of the most integrated and most transparent projects about accommodation possibilities in Slovakia. Except accommodation, one can find here also data about spa facilities, congress and training centres, restaurant services, camping possibilities and last, but not least, it provides a large spectrum of information about Slovakia for the tourists. If your products or services belong among those that we can offer to the users of our information project, then our internet portal is an ideal chance to promote yourself. You can promote also thermal swimming pools, aquaparks, agrofarms, sport facilities, relax centres, various attraction, etc. Prezentácia na našej stránke je spoplatňovaná, v prípade záujmu o uverejnenie Vašich služieb vyplňte náš formulár a zašleme Vám podmienky registrácie. 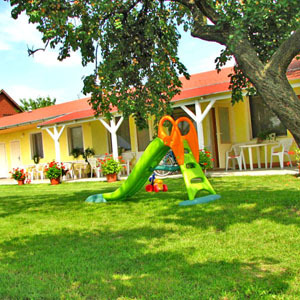 Apartments Szabo, Velky Meder - caravans, tentsLarge lawn suitable for camping, barbecues, sports, games and recreation.